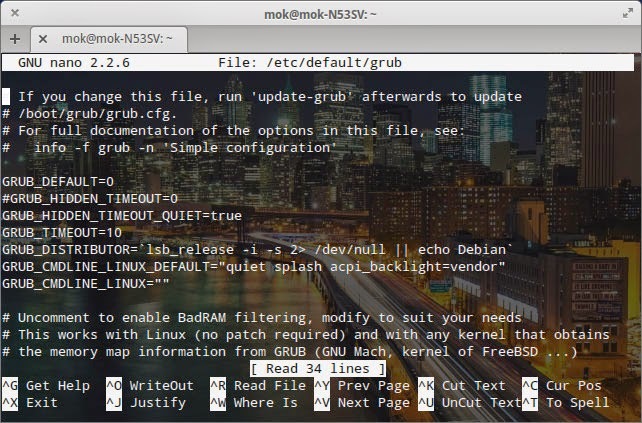 Find GRUB_CMDLINE_LINUX_DEFAULT="quiet splash". Replace the whole line with GRUB_CMDLINE_LINUX_DEFAULT="quiet splash acpi_backlight=vendor" as screenshot below. Press ctrl + o to WriteOut/Save and press ctrl + x to Exit. You guy are just an angel! you saved my phone! thanks bro' you rock! life saver right here, thanks!!!! You have a China made phone. Hello there! This tutorial is 100% workable! I thought my Nokia C6-01 wouldn't be reset but thank you to this and to Shala.. Good job guys! 2 thumbs up for you two! To other people who is experiencing the same thing, download the NSS Pro (Nokia Service Software Professional) Version 0.52 and not the Nemesis blah blah. The latter is a pirated version and will not install properly and eventually will not reset your Nokia.